Recently we came across the work of Czech designer Maxim Velčovsky and was blown away by its intricacy and craftsmanship. Maxim Velcovsky is the art director of Lasvit, a Czech Republic-based lighting and glassware company that made their name creating world-class sculptures and bespoke art installations from hand-blown glass. Their art pieces can be found around the globe in the world's most prestigious hotels, private residences and high-end boutiques, including displays in Singapore's Changi Airport, Dubai Opera, and Sochi Casino and Resort. Some of our favourite art pieces from Velčovsky is his glass bubbles concept. Thousands of small, perfectly round hand-blown glass modules are used in each of theses installations, strategically grouped together to create a constellation that forms an image. Much like pixels on a large canvas, the full picture can only be perceived and understood when looking from a distance. Velčovsky stated that the concept is very much inspired by nature, where the glass bubble resembles the organized chaos of the chemical molecules that are all around us. Glass bubbles cover the walls of four lobbies in the Butterfly office complex in Karlín. Faces of famous people who contributed to this Prague riverside neighbourhood congeal from an abstract molecule cluster. The installations were assembled based on a formal computer-generated blueprint and then fine-tuned, so that the viewer’s brain could perceive the bubbled constellation as a portrait. 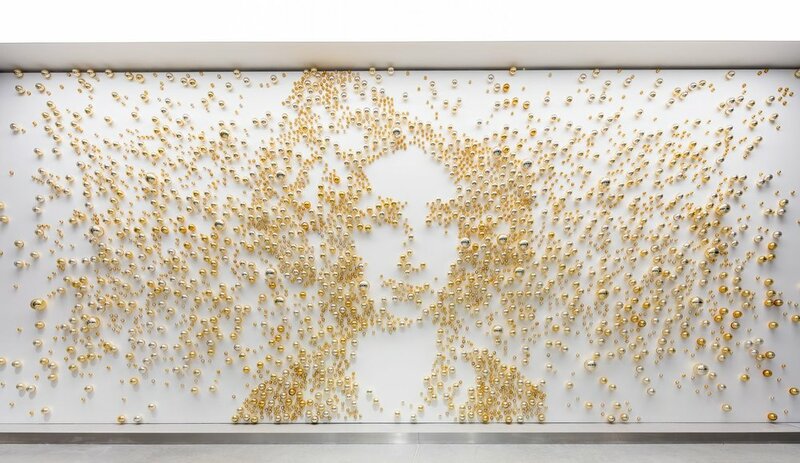 Over three thousand glass bubbles had to be made to create each portrait. They were then placed on the interior walls and assembled into a seemingly random constellation of dots which, upon closer look, reveal a concrete image. These “glass paintings” show the faces of the Austrian Empress consort Caroline Augusta of Bavaria, the inventor František Křižík, the legendary Czech industrialist Emil Kolben and the actress Olga Scheinpfluge. 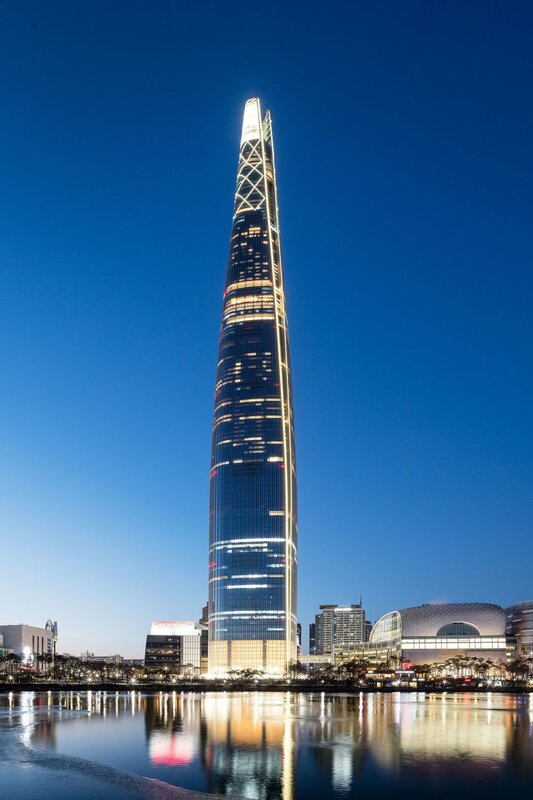 Lotte World Tower is a 123-floor, 555-metre skyscraper in Seoul, South Korea. Its silhouette has quickly become one of the city’s modern-day icons. The astounding height of the building lobby is the perfect ground for this whimsical installation, where 18-thousand monochromatic white glass bubbles are hung at varying heights to resembles air bubbles surrounding the key installation piece - a female diver diving into the depths of the ocean. Inspired by Korean female divers that have been ventured into the heart of the deep blue sea for centuries, the 17-meter long installation captures the spirit, courage and untiring endeavour of these individuals, called 'Haenyeo', that revolutionized the male dominant Jeju diving tradition dating back to 434 A.D. Designed by Velčovský, it consists of thousands of manually blown bubbles of glass mounted to a skeleton of steel. “The idea was to get this sculpture, The Diver, consisting of 18 thousand glass balls, into the air. It is placed in the Lotte Tower, one of the tallest buildings on the planet, and upon entering, you see this six-metre diver, swimming above you.” says Velčovský. Installations of this kind had been dwelling deep in Maxim Velčovský’s mind for quite some time, with an occasional sketch coming up every now and then. However, it was the Lotte Tower interior where at last the idea finally surfaced, envisioning stories of the ancient tradition of Korean female divers. (Left) Lotte World Tower in Seoul, Korea. (Right) The diver installation in full view. To see more of Lasvit's incredible and imaginative glass masterpieces, visit here.